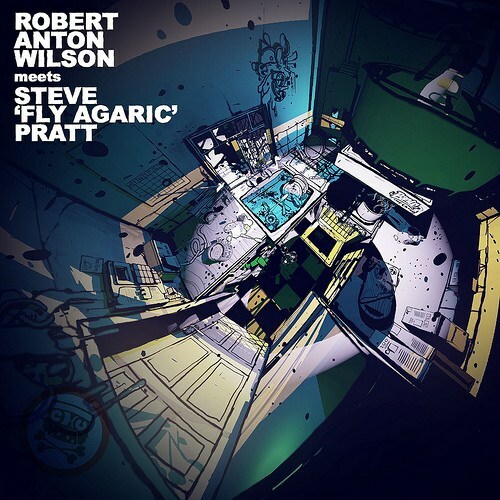 Robert Anton Wilson meets Steve “Fly Agaric” Pratt is really two albums in one: A spoken word album, featuring Pratt's interview with RAW, and a music album, with a soundtrack from the likes of Pratt, Youth (Paul McCartney's "Fireman" partner), Richard Rasa, Tim Egmond, Hagbard Celine and Garaj Mahal. (Pratt, a talented drummer, has played with Garaj Mahal). The album succeeds on both levels. The music is quite good and you can focus on that if for some reason it is not convenient at the moment to concentrate on the words. And the interview is meaty: While some of the topics Steve asks about cover familiar topics, he obviously worked hard to come up with new, fresh questions. (It's the only time I've seen or heard anyone ask Wilson, "What is your favorite sound?" This is a substantial interview. You can read Steve's detailed online notes on the background of the interview, if like me you bought MP3 files of the album instead of buying the CD. Bob Acid by Steve Fly, feat. samples by Tim Egmond, Michael Ray (trumpet), live drums by Steve Fly, together with an excerpt from ‘Lonely No Longer’ by Youth. 2014. Music by Steve Fly, taken from the ‘Alan Moore discusses Robert Anton Wilson DVD, which was a perk of the Cosmic Trigger Play crowd-fund campaign. 2014. Drums intro by Steve Fly cut from the Cosmic Trigger Play, followed with ‘Nebula’ by Youth. 2014. Drums by Steve Fly from the play, followed with ‘ by Zanoni by Rick Rasa. 2014. Drums intro by Steve Fly cut from the Cosmic Trigger Play, followed with Shiva Nam Kevalam by Rick Rasa. 2014. Drums by Steve Fly from the album ‘I mean you’, followed with excerpt from by ’Suspended Atmosvex Pt2’ by Youth. 2014. Drums by Steve Fly taken from ‘I mean you’, together with an excerpt from ’Black Mass’ by Hagbard Celine (Ameoba) 2014. Music by Steve Fly, instrumental tracks ‘Mohawk’ ‘Carolina Moon’ ’My Melancholy Baby’ ‘Nobody Knows’ all from the album Mohawk, with John Sinclair. 2014. Bicycling In Bombay (Steve Fly Remix 2006) by Garaj Mahal: Kai Eckhardt - Bass, Fareed Haque - Guitar, Alan Hertz - Drums, Eric Levy - Keys, Steve Fly - Turntables. Harmonized Records, 2005. Martin Youth Glover sent a collection of remarkable ambient electronica productions for use in the Cosmic Trigger Play, used here with permission. Thanks Yoof. Garaj Mahal are Kai Eckhardt on Bass, Fareed Haque - Guitar, Alan Hertz - Drums, Eric Levy - Keys, Steve Fly - Turntables. 2005. Hagbard Celine (Ameoba) created a series of ambient works for initiatory purposes, used in the Cosmic Trigger Play. Rick Rasa also kindly contributed some of his delightful ‘starseed’ sitar compositions to the Cosmic Trigger Play. Tim Egmond and Steve Fly have collaborated on dozens of projects and tracks, Tim recorded and engineered and co-edited Mohawk by fly and John Sinclair, plus provided many useful samples used in the Cosmic Trigger Play. Thanks to Daisy and all those who helped the play see light of day, and all those who helped support the musical framework of the interview.